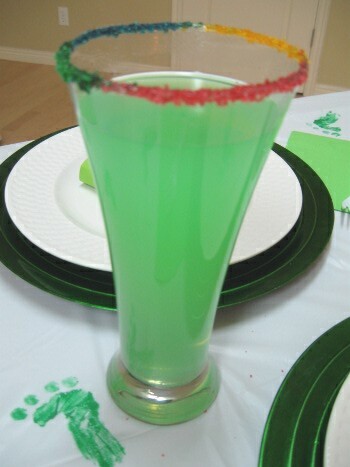 Create a few of your own shenanigans this St. Patrick’s Day for the family to enjoy! Another year for a chance to get our GREEN on! We have so much fun as a family on St. Patrick’s Day. It’s an annual tradition at our house to let the leprechauns play around all night while we sleep. Bright and early the next morning we enjoy what they’ve left behind, one BIG Irish mess of complete fun! This year Caitlyn, her cousin and friend had a blast trying to catch Leprechaun Pete! This ordeal lasted pretty much all day and I’m pretty sure it’s because of my party set-up and a few other extra clues Pete left behind. Take a look at my simple set-up that caused so much determination just to capture a little green man. Leprechaun Pete lead Caitlyn on a treasure hunt right when she woke up. The look on her face was all worth the extra effort. The idea came from www.momtastic.com who already had the clues filled with cute limericks to download on her site. It might even be kind of fun to make up your own. At each location Leprechaun Pete left chocolate gold coins and finally his last clue lead her to the breakfast table where her treasure was waiting…a few REAL dollars in her little black pot. What caught her attention most was not the money but his funny little footprint he left behind on her plate. A WEE bit of Fun! Leprechaun Pete pulled all sorts of shenanigans! This is by far my favorite and one I’ll be doing again next year! My husband even got a kick out of it when he was the first one to see it. Thank goodness he played along and didn’t have a fit on how we were gonna get the paint off! I think everything tasted better all because of this one silly little footprint. 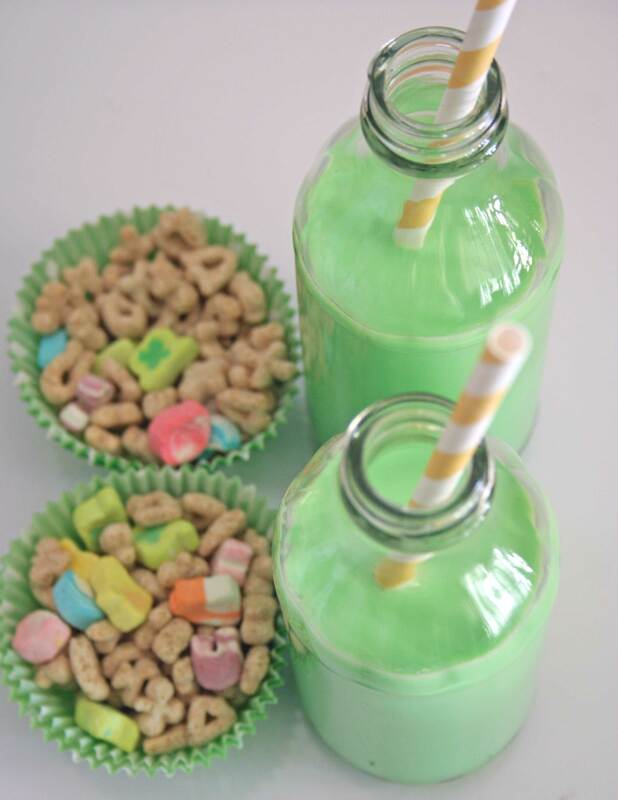 I didn’t go wild on the green food coloring this year and kept my breakfast traditional all except for her glass of green milk to add to her lucky charm cereal. Easy for me and a complete joy for her! Here’s where I got my inspiration from! This mommy planned a simple yet lucky breakfast for her girls. 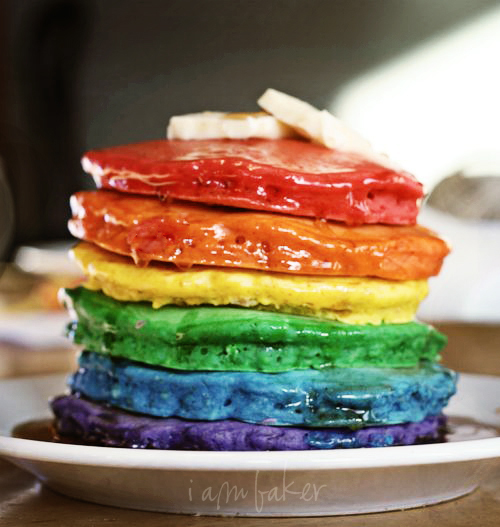 If your in the mood for a little more work but plenty of applause from the family try making these awesome pancakes by iambaker! They almost look to pretty to eat! This was so much fun to put together the day of. While the kids were playing I’d sneak and add a few things to the table. This began that hunt for that little green man and it was so much fun listening to their plans each time a new clue was brought to the table. Here’s a few of the clues. I’m not sure how they gave me enough time to even do this but it all worked out with great timing and no evidence was ever found! I used a $1.00 store white table cloth and went a little crazy with the green paint. If your asking how just use your hand rolled up in a fist, paint the outer side curving around your pinky and stamp away. 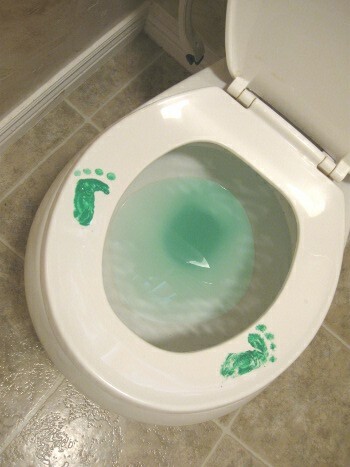 Use your fingertip for the toe prints. 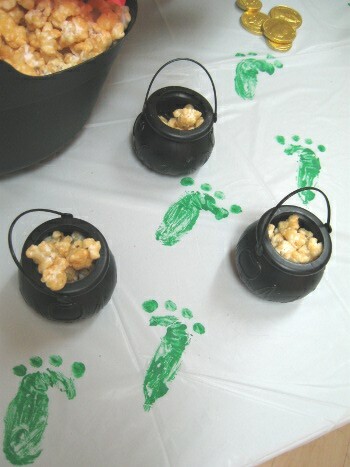 Our pot of gold was a bowl of yummy golden caramel corn. It was so good I assume because before we even had dinner the popcorn was gone! The kids decided to leave trails of popcorn and well to their surprise the crumbs mysteriously disappeared, my only chance at tasting it thankfully! 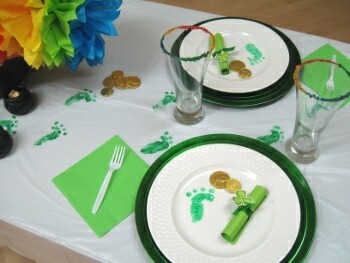 I set these out just so you could see how fun it might be to set them at each plate for the kids before they wake up. I’m glad I did this treasure hunt because Caitlyn is still talking about how fun it was. 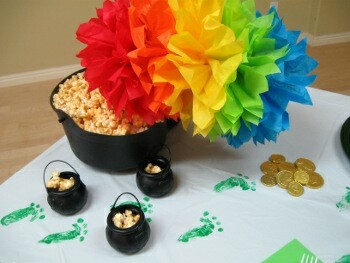 At the end of our rainbow or tissue balls, Leprechaun Pete left a pile of gold coins. 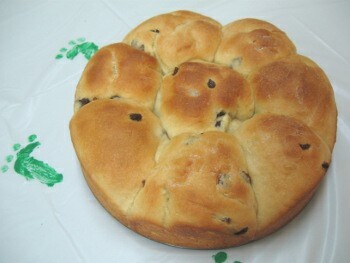 I saw a picture of this on Pinterest and new it would be on our menu for dinner. Glad I made it because it was super simple. 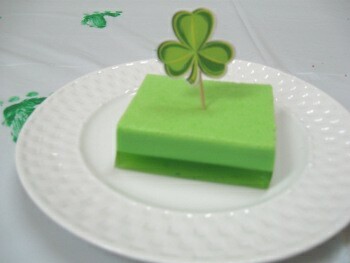 The best part is you get two desserts in one, ice cream AND jello! 1 Quart vanilla Ice cream. Stir to dissolve. Pour into a 9 x 13 glass dish. 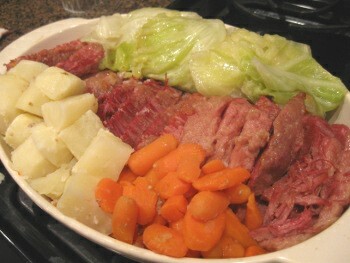 Refrigerate overnight, cut and serve. The ice cream will float to the top. Hi Patty and Heidi! My name is Dina Roth Port. I’m a freelance writer for national publications ranging from Glamour and Self to Parents.com and Prevention. I love your ideas about the leprechauns and I’d love to include them in a story I’m working on for iVillage.com, one of the most popular websites for women. 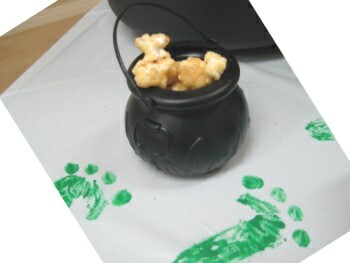 The story is about all the mischief leprechauns can cause on St. Patrick’s Day, and your pictures are perfect! Please let me know the best way to reach you to discuss this further. Basically, if you could send copies of these images (pdf), I’d put them in the piece and credit you and your website. Let me know what you think! Thanks for your time. You are very creative! !